Please include contact information and EMAIL ADDRESS with your check. THANK YOU SO MUCH for supporting this fundraiser. The response this past November and December has been overwhelming. The new studio received about 250 gifts from 25 different US states and Canada, and far exceeded my original goal! I've received in this campaign. It's been breathtaking. from the studio as it develops! For the last 13 years, I've been touring all over the United States and Canada, performing at thousands of churches, special events, interfaith gatherings, hospitals, prisons, schools, senior centers, shelters, and homes. great joys and privileges of my entire life. But over the past couple of years, I've noticed a new love and passion brewing: Producing records. Not only my own music, but other artists as well. If you're aware of the Positive Music community, you'll recognize some of the artists who have passed through my small studio -- Harold Payne, Sue Riley, Megon McDonough, Richard Mekdeci, Karen Mitchell, Mary Coppin, Kelly Corsino, and more. All these folks share my dream of making a real difference in the world through our music. Truth is, my record label is called "Humanity Music Company" for a reason: I make music for humanity. Whether it's inspirational, environmental, childrens', folk, instrumental, even pop and rock, it's my vision to make music for ALL of humanity -- to bring humankind together in song as best I can. (You might be familiar with my Sacred Love songs, which I call "hymns for humanity" for that reason.) I'm proud to say that my productions have been nominated for many awards, have appeared on major television networks, and have been licensed for a wide variety of compilations and uses. The challenge is, my small home-based studio is not spacious or sophisticated enough to take this Humanity music to the next level of quality and exposure. It's time to move out... and to step it up. And if you're willing, that's where you come in. I don't need a huge space, nor a fancy one - but even a reasonable-sized studio is a pretty expensive proposition. That's why, between now and Thanksgiving Day, I'm announcing a fundraising campaign to help finance the building of the new Humanity Music recording studio. It's envisioned as a place where artists of all genres and styles, all backgrounds and faiths, can come to record world-class music, to fulfill their musical vision, to reach and touch the world. I'm seeking $30,000 (or more, of course! ), for space rental, acoustic treatment, and significant upgrades in microphones and other equipment. I'm structuring this fundraiser with several options. But first let me share one idea I'm quite excited about. I don't want you to feel like your gift is a gift to ME -- it's a gift to the studio, and even more so, a gift to Music for Humanity. Therefore, a portion of every donation will be added to a SCHOLARSHIP FUND, which in the future will enable artists to record their song for free, or at reduced cost, through a simple application process. Your gift will allow an artist who otherwise might not be able to afford to record... to capture their song for posterity. And for humanity. There are other gifts and Thank You's, as you see on the left side of the screen. A donation of any size will put your name on a wall in the new studio, with my endless gratitude for your support. A donation of $25 or more will get you access to a private online Thank You Concert from the new Studio in 2013. $50 gets you a signed CD, $100 gets you three CDs. $200 adds not only the concert but also a complete collection of my recorded music. $250 adds an invitation to a private reception at the Studio next year. A donation of $500 or more will list you as Executive Producer of my next inspirational CD, plus a visit to the Studio to add an instrument (or your voice) to a new recording. And a donation of $1,600 within California/Arizona, and $2,800 elsewhere in the U.S., will entitle you to a private concert at your home, house of worship, or organization. I hope you know how much I appreciate the years of support you have shown me. It's not necessarily within my comfort zone to raise funds in this way. But I really feel like the time is right for my musical work to evolve in this direction, so I'm taking the leap. And in doing so, I'm asking for your help. I am deeply and truly grateful. 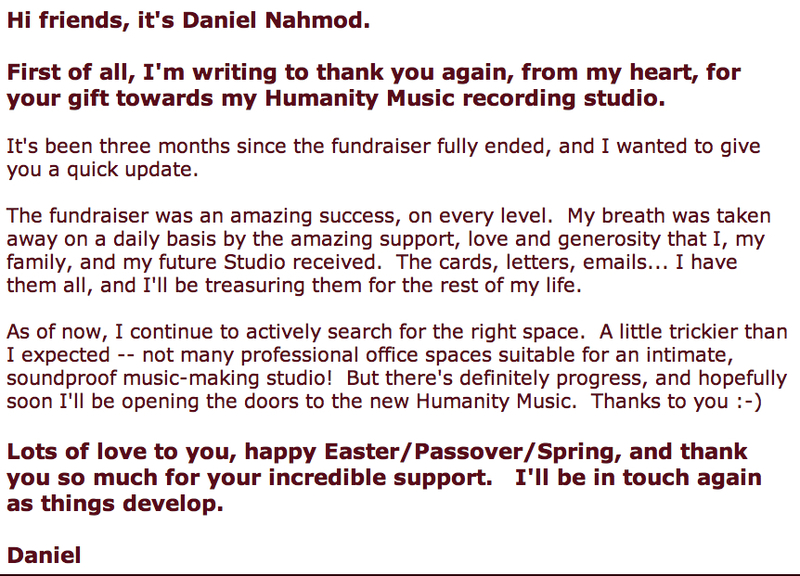 (c) 2012 Daniel Nahmod and Humanity Music Company. All Rights Reserved.